Clin Cancer Res 2014 20, 4806-15. PHA-665752 purchased from Selleck. A, SCID mice bearing established HCC827/GR tumor cell xenografts were treated with each drug. The length and width of the tumors were measured at the days indicated and tumor volumes were calculated. The bars represent mean tumor volume ?SD. B, immunohistochemical staining for Ki-67 and TUNEL, as described in Materials and Methods. Quantitative data for proliferation and apoptotic indices are shown as Ki-67+ cells (left) and TUNEL+ cells (right). *, P < 0.01 and **, P < 0.001 for the combination of gefitinib plus NPS-1034 or gefitinib plus PHA-665752 versus either the control or drug alone. Cancer Res 2014 74, 253-62. PHA-665752 purchased from Selleck. C, Western-blot analysis of MET phosphorylation and its downstream effectors AKT and ERK1/2 in two MET-dependant cell lines (MHCC97H and HCC-3) treated 4 hours with increasing doses of PHA-665752, JNJ-38877605 or tivantinib. Clin Cancer Res, 2017, 23(15):4364-4375. PHA-665752 purchased from Selleck. PHA-665752 increases the radiosensitivity and reverses the radioresistance induced by HGF in NPC cells. Radiosensitization induced by PHA-665752 is accompanied by the persistence of the c-H2AX foci. Representative immunofluorescence micrographs of the c-H2AX foci formation in PHA-665752 (1 uM), HGF (20 ng/ml), IR and their combination groups. The micrographs were taken at x 400 magnification. Biochem Biophys Res Commun 2014 449(1), 49-54. PHA-665752 purchased from Selleck. Radiosensitization induced by PHA-665752 is accompanied by the persistence of the γ-H2AX foci. (Top) Representative immunofluorescence micrographs of the γ-H2AX foci formation in PHA-665752 (1 uM), HGF (20 ng/ml), IR and their combination groups. The micrographs were taken at x400 magnification. (Bottom) The median number of the γ-H2AX foci per cell. The bars indicate the SD. ∗P < 0.01 compared with the IR alone group. Biochem Biophys Res Commun 2014 449, 49-54. PHA-665752 purchased from Selleck. Western blot analysis of p-c-Met and c-Met. 0-100μM PHA665752 was added. Dr. Zhang of Tianjin Medical University. PHA-665752 purchased from Selleck. The c-Met kinase domain GST-fusion protein is used for the c-Met assay. 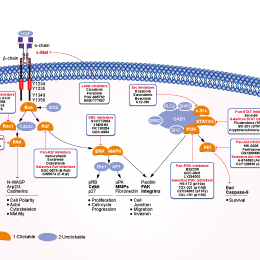 The IC50 value of PHA-665752 for the inhibition of c-Met is based on phosphorylation of kinase peptide substrates or poly-glu-tyr in the presence of ATP and divalent cation (MgCl2 or MnCl2 10-20 mM). The linear range (i.e., the time period over which the rate remains equivalent to the initial rate) is determined for c-Met, and the kinetic measurement and IC50 determination are performed within this range. Method: For proliferation assays, cells are grown in medium with 0.1% FBS for 48 hours after which they are treated with various concentrations of PHA-665752 in HGF (50 ng/mL) in a medium containing 2% FBS. After 18 hours, cells are incubated with BrdUrd for 1 hour, fixed, and stained with anti-BrdUrd peroxidase-conjugated antibody, and plates are read at 630 nm. For apoptosis assays, cells are grown in medium with 2% FBS in presence and absence of HGF (50 ng/mL) and various concentrations of PHA-665752 for 72 hours. After 72 hours, a mixture containing ethidium bromide and acridine orange is added, and apoptotic cells (bright orange cells or cell fragments) are counted by fluorescence microscopy. Administration: Injection via bolus i.v. Christensen JG, et al. Cancer Res, 2003, 63(21), 7345-7355. Ma PC, et al. Clin Cancer Res, 2005, 11(6), 2312-2319. Puri N, et al. Cancer Res, 2007, 67(8), 3529-3534. I need to use S1070 for intraperitoneal application in mice. Could you tell me the solvent you use, please? The highest concentration of PHA-665752 (S1070) in 4% DMSO+30% PEG 300+5% Tween 80+ddH2O is 5mg/ml. If you want to get higher concentration, the concentration of DMSO and PEG will be higher. For example, it can be dissolved in 8% DMSO+50% PEG 300+5% Tween 80+ddH2O at 10mg/ml clearly.